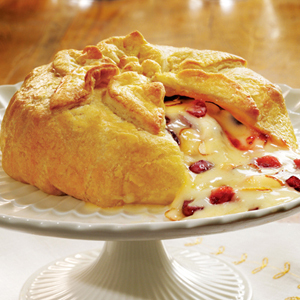 http://www.JewishWorldReview.com | (MCT) Although there are many variations for baked Brie, they all combine a delicious, flaky crust with a creamy, melted, oozing cheese. An elegant dish in any generation. These recipes are pretty simple, and it sounds hard to mess up, but you do need to take some precautions. Just like the little girl in the nursery rhyme, when Baked Brie en Croute is good, it's very good, but when it's bad, it's horrid! OK, let's break it down. Real French Brie is a soft cheese made from unpasteurized cow's milk. The authentic cheese is illegal to import into the United States, because cheese made with raw milk must be aged at least 60 days before transporting it here. By the time it aged long enough to travel to America, Brie would be overripe. French Camembert is in the same boat (I guess I should say it's also illegal to put in the boat). Fortunately, versions of both of these cheeses made from pasteurized milk are readily available. But if you go to France, make sure you try the real thing. Remember when you said your party dish was popular decades ago? Legend has it that Brie (which has been dubbed "the king of all cheeses") was a favorite of Charlemagne's during the eighth century. Brie was always on the table for King Louis XVI of France. When his table was turned during the French Revolution, he is rumored to have requested Brie for his last meal. Brie ripens in only one to three months (depending upon its size). It has a completely edible white rind. For Brie en Croute, purchase a wheel that is slightly underripe; it should have a firmness to the touch and a sweet smell. An overripe Brie  which is death to this preparation  will have a gummy rind and a hint of ammonia odor that will strongly intensify when cooked. When you cut into it, the smell will make you think that it was left over from the French Revolution. Even though you want the cheese to melt, you don't want it to run all over the plate or you'll wind up with a greasy pool of cheese and an empty shell. One trick that definitely works is to freeze the Brie for 10 to 20 minutes (depending on its size) before baking. Not only will this keep the Brie from running like lava, it also helps keep the crust crisp. There are two things that help ensure success with the "en croute," or crust. When buying frozen puff pastry, look at the ingredients and try to purchase one that uses butter instead of oil. Butter creates a crispier crust. The second technique to guarantee a flaky, crispy pastry is to use a hot oven, somewhere between 400-435 degrees, again depending on the size of your cheese wheel. The larger the wheel, the (slightly) lower temperature you want for your oven. First, experiment away with all kinds of spreads. Try a variety of jams, jellies or preserves. You can stud the cheese with different types of nuts or dried fruit, too. Finally  enjoy! They'll be talking about your Brie en Croute 30 years from now. Thaw puff pastry according to directions on box. Lightly beat the egg with 1 teaspoon of water to make an egg wash. Set aside. Once flexible, unfold the pastry into a square on a lightly floured surface. Roll out the pastry slightly, to about 1/8 inch thick. Lay puff pastry in a shallow pan or plate. Slice cold brie wheels in half so there is a top and a bottom. Center one half of the brie bottom side down on the puff pastry. Top the bottom half of the brie with 2 tablespoons of the preserves and half of the toasted almonds. Place the other brie half on top, rind side up. Gather up the opposite corners of the puff pastry at the top of the brie to make a little package. Bring the ends together and give them a twist and a squeeze to keep them together. Gently pinch together any open seams on the sides. Repeat with the second brie and place both in the freezer for 10 to 15 minutes. Place the wheels seam side down on an ungreased baking sheet. Use a pastry brush to brush both with the with egg wash.
Place in a preheated, 425-degree oven for 10-15 minutes. Bake until golden brown. Remove from oven and let rest 10 minutes, then transfer to a serving platter. Serve with water crackers or toasted baguette slices. Thaw the puff pastry sheet according to directions on box. Lightly beat the egg with 1 teaspoon of water to make an egg wash. Set aside. Once flexible, unfold the pastry into a square on a lightly floured surface. Roll out the pastry slightly, to about 1/8-inch thickness. Spread the jelly in the middle of the pastry in a circle the same size as the wheel of brie. Sprinkle the pecans over the jelly and place the brie on top. Bring two opposite sides of pastry up and over the cheese. Fold in the other sides, trimming any extra, and "gluing" it together with a small amount of egg wash.
Place seam side down on an ungreased baking sheet. Using a pastry brush, brush wheel with egg wash. Bake in a preheated, 400 degree oven for 20-25 minutes, until golden brown. Let stand 15-20 minutes before serving. Serve with water crackers or toasted baguette slices.